Kuala Lumpur, 27 July 2016 - The past year proved to be very rewarding for International University Malaysia. Several of its students garnered strings of world-class achievements internationally. Now, another student has once again made the nation proud. Bushra Farooq was bestowed the prestigious Diana Award at a national award ceremony in London recently. The Diana Award was set up as a lasting legacy of Princess Diana’s belief that young people have the power to change the world for the better. 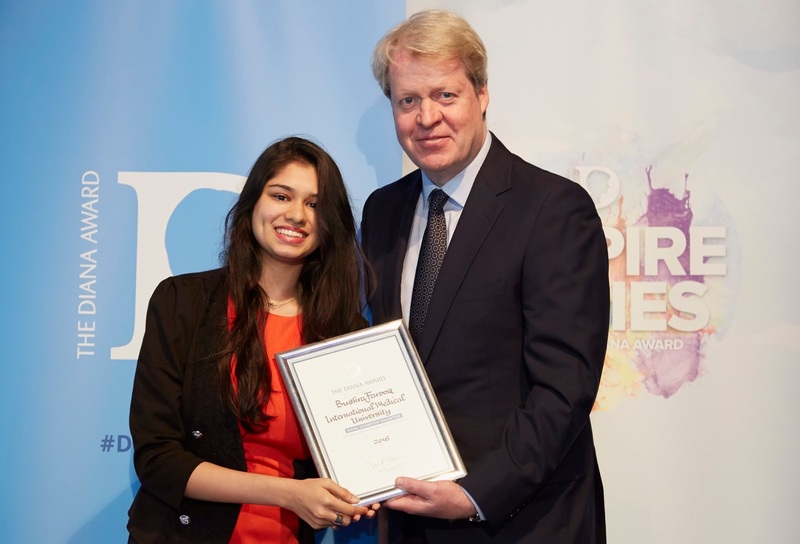 The 19-year-old Bushra Farooq, an Psychology student from Kuala Lumpur, was recognized as the Regional Award winner in the Diana Champion Volunteer category for volunteering over 500 hours of her time to various causes in Malaysia and Oman. She spent these hours working with cancer patients, orphans, on a sexual education project for refugee children and with the ‘Do Something Good’ organization. She has also been actively involved in various community projects via the University-run Cares. The Cares is a platform for staff and students of the University to make meaningful contributions to the community in producing skilled, knowledgeable, caring and ethical health professionals who will serve the community at large. “The reason I am passionate about the volunteer work I do is to fulfil my desire to help others. My vocation in Psychology has definitely helped me to further equip my passion,” she continued. Besides her studies, Bushra is currently volunteering through Incitement, which organises independent events to promote volunteering and create social impact around the world. She is also working with the Global Youth Ambassador Program as an alumni to help fundraise for causes in Vietnam. “In later life, she endlessly displayed her great affinity towards children and the vulnerable. It is because the Diana Award fits so perfectly with my late sister’s core values that I’ve always been one of its greatest supporters, and why I am proud and delighted to be present at this ceremony,” he added. The 80 recipients of the Diana Award were identified and nominated by members of the public. They are recognised for their selfless service and huge amount of energy to improve their communities and the lives of others. Since 1999, over 47,000 youths have been recognised with a Diana Award for continuing Princess Diana’s legacy and making an outstanding difference in their communities’ across the globe. The award is supported by Princess Diana’s sons, the Duke of Cambridge and Prince Harry. The Diana Award supports the development of youths through a range of peer-led programmes which builds character, develops skills and improves their life opportunities.